In this Tour with EcoCircuitos, you will come back in your early childhood of the pirate world. Put on your boots and your pirate hat for the adventure. 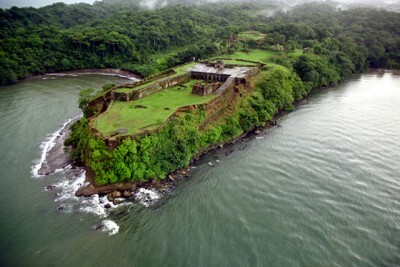 Located in a rocky headline, 25m above the sea level and overgrown, Fort San Lorenzo Casstle dominates the mouth of the Río Chagres. The natural beauty of the caribbean, the view over the river and the lush forest are outstanding. The Fort San Lorenzo evokes the struggles of the colonial era between the Spanish and European filibusters. San Lorenzo is one of the oldest forts and the best preserved of America. The first foundations were built in the late of sixteenth century to protect the Spanish ships, leaving the river, against hackers lured by the riches to Portobelo. This fort is full of History. First the fortifications were attacked and demolished at the beginning of the year 1671 by the captain Joseph Bradley on behalf of Henry Morgan. He stays few times there, before sake the Old Town of Panama. The Forts have been reconstructed two times. In 1678, more height, the fort was destroyed again in 1742, this time by Admiral Vernon. Rebuilt in 1761, he played a strong role until independence in 1821 and serves as a prison for some years. In 1980, San Lorenzo was even registered with Portobelo Fort as a UNESCO site heritage. Forty cannon would has been found on the site. Around the fort, in the rainforest, there are many ecosystem and nearly one third of all the forest fauna of Panama. This is a complete adventure day where hiking, wildlife observation and amazing history can be experience in one day. Ohhh and part of the experience includes crossing by car the Gatun Locks of the Panama Canal! don´t miss this in Panama.